A portable power bank which tends to use salt as well as water for recharging smartphones has been put up on show at the Mobile World Congress tech show in Barcelona.Swedish start-up MyFC unveiled its cool technology called Jaq at the CES on Jan 6. It is said that the device is small enough to be slipped into the back pocket and is fuel cell charger. It utilises saltwater and oxygen in converting chemical energy into electricity. 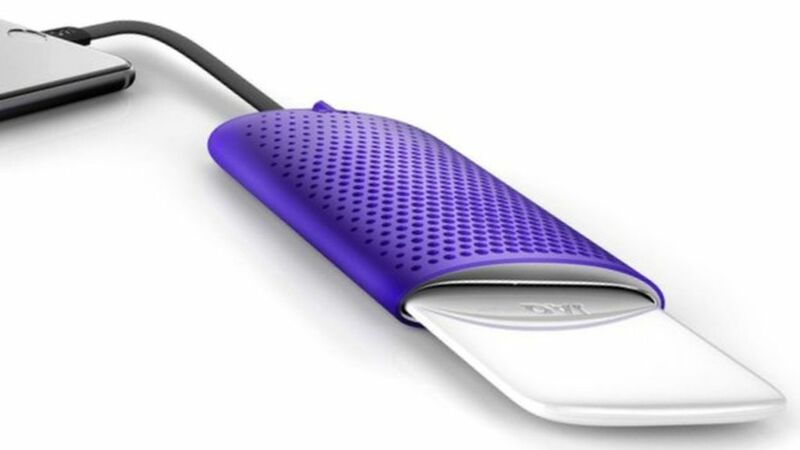 The Jaq cell charger comprises of colourful rubber sleeve together with a credit card-sized `power card’ containing saltwater. It tends to work by causing detached chemical reaction between the saltwater – fuel and oxygen – oxidant wherein hydrogen molecules from the water tends to enter the fuel cell at the anode. The outcome of the reaction tends to produce electricity and water which the device connects and utilises to charge the phone through a Micro-USB cable. It is said that one power card can generate 1,800 mAH amount of electricity which would be adequate in charging an iPhone 6S completely though each power card could be used only once. The charger comprises of a credit card shaped `power card’ and a hollowed out port which is about the size of a smartphone. The card contained saltwater that tends to fuel electricity producing chemical reaction when one slips the card into the port. To obtain electricity to the battery of the phone one needs to plug the phone into the port with a standard cable.The Jaq charger does not require plugging in, since it tends to utilise disposable cartridges in generating power. Chris Foxx of BBC had asked Bjorn Westerholm the company’s chief executive if it was better for the environment than using the normal battery based power banks. It is the world’s smallest charger of its type and the device has got its European unveiling offers up speedy phone charging without the need of plugging it in a socket. It is owing to Jaq powering itself with the help of its own PowerCard that is made of water and salt. When this is stuck in the charger, some chemical magic hydrogen is created and the charge takes place. It tends to charge a phone just the same time a normal power outlet does. Though the chemical reaction and hydrogen may sound a bit dangerous, MyFC undertakes the responsibility that the chemical reaction seems to be completely safe and that it is also environmental friendly. The MyFC Jaq seems to be compatible with all phones as well as tablets inclusive of iOS and would be made available in white, black and purple. Though the release date is not yet out, MyFC has put the Jaq up for pre-order wherein one can sign up to have PowerCards sent to them on a subscription basis.